I started with a nice medium blue tablecloth that I had had custom made several months ago to fit our long dining table. The fabric was sent by my sister and another sister-in-law arranged to cut and sew it into a tablecloth. It has a simple diamond pattern on it to give it texture. 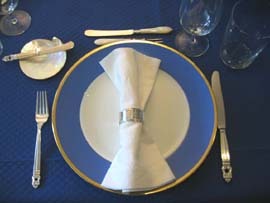 The plates looked pretty good against this tablecloth and then I just added the silver cutlery, plain Reidel wine glasses and a small mother of pearl butter plate to pick up the theme of the mother of pearl fruit or dessert knives and forks at the top of the plate. Most of the components of this place setting are generous presents from a sister that trolls the auction houses in New York for great buys or who just enjoys all nice things for the table. I had no flowers by 10am the morning of the dinner so I thought I would just fall back on plain white orchids in simple crystal vases. But sometimes nice things just fall into place and a shot in the dark visit to my Makati flower wholesaler yielded spectacular bluish tinged hydrangeas that I mixed with some light green ones I had in pots and some white dendrobium orchids that had tinges of light green. Placed in several crystal vases and throw in some votive candles and it looked pretty darn good, if I say so myself. Arrangements took 15 minutes to make, max. For dinner, we started with some cold seafood including these humongous crab claws that are a bit out of focus. This was followed by a nice salty Southern ham (from Paris, Tennessee), baked sweet potatoes, asparagus and an apricot compote that I made the night before. We also served nice hot crusty French bread. This was a rather low intensity dinner. The seafood was brined and steamed ahed of time, allowed to chill in the fridge. The ham was cooking earlier in the day and a last minute glaze of mustard, brown sugar and a little vinegar was applied and cooked until a bubbly, caramelized state. On Riedel glasses … I remember attending a hoity toity “glass tasting” session once where the hosts were telling us how great Riedel glasses were because they had a special wine glass for almost every wine imaginable. but I just took out my kosta boda snow globes candle holder for my table. Where can I get that mother of pearl plates? What a lovely blue setting! thats the one I have been lookinf for CAVIAR SPOON.. where can i get them? those mother of pearl spoons are too expensive in UK and in France every time I see them all I could think these must be a lot cheaper in Phils. anyhow I also want to know about yr nara salad bowl… opps out of topic here but my friend is coming back and I asked her to look for one. Sha, the large narra salad bowl I have I got in Baguio and requested that it be left unfinished with no varnish or anything. I also have a mango wood bowl that was given to me over 10 years ago that is spectacular but not usually found in stores. The Mother of Pearl Spoons are very cheap here $5-8 depending on size and your friend can find them at any Balikbayan Handicrafts outlets… I often give sets of MOP plates and caviar spoons to Western friends’ as wedding presents, etc. If I ever get the chance to come home I’ll make sure I can get hold of you. I’ve read heaps of your blogs. I want to meet the author and hopefully get invited to your lovely home, where everything comes together. Keep up the good work. Gi Bogbog ko sa Kabog!! !